This entry was posted on June 30, 2015, in Coliseum Northside Hospital and tagged CEO Steve Daugherty, Coliseum Northside Hospital, Steve's Weekly Wrap-Up. Bookmark the permalink. As one of the largest employers in middle Georgia our profile in the community is high. That profile is no higher than when we contribute to something as important as the American Red Cross Blood Bank whose work saves so many lives in our community. 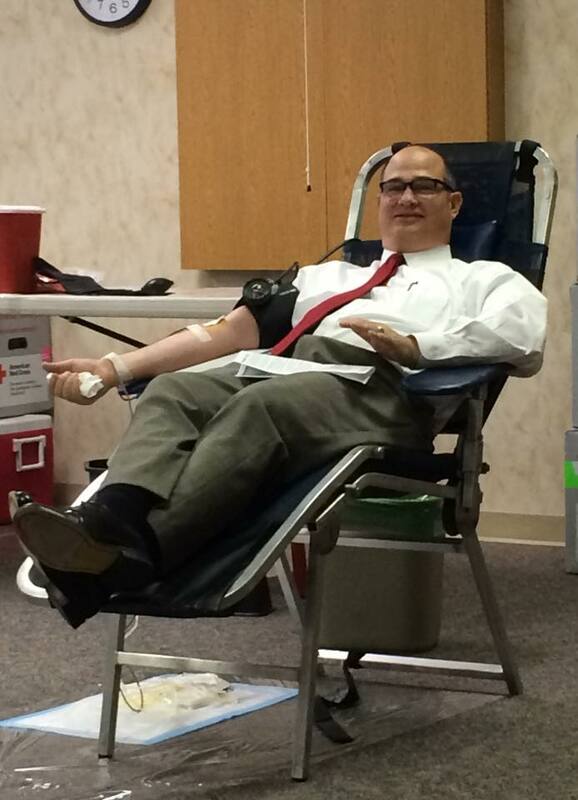 Thank you to all of our employees who came out in support of this week’s blood drive! A total of 27 units were collected, which is absolutely amazing!! The units collected will provide lifesaving blood and/or blood products to approximately 81 patients in our community. Thanks for answering my challenge to give back in such a meaningful way. The winners of the gas card drawings were Brittany Varga (3rd floor) and Angela Jones (Bariatric Center). The highest participating department and pizza party winner is the Operating Room! Yesterday my wife Lynda and I had the opportunity to attend Rep. Robert Dickey’s annual Peaches and Politics in Musella. I had the opportunity to meet Gov. Deal for the first time as well as visit with Rep. Dickey and Sen. John F. Kennedy. Rep. Dickey’s wife Cynde serves our CNH Community Advisory Committee as many from the Musella area use our hospital. It is important for them to know us and our health system so that when important legislation comes up in Atlanta we have a relationship that helps our voice in those decisions be heard. Whether it is medical marijuana, certificate of need or Medicaid expansion we need to be one of their sources of information. You can help also by signing up for our Good Government Group. Also in attendance were Greg and Robin Parker, John and Alyson Cozart and Sheldon and April Mattox. My thanks to everyone who participated in our LEAN Process Improvement exercise today to examine our Registration process and how to make that process easy and efficient for both our physician office and our patients. Today was the first step in designing a process around the needs and expectations of our customers and adding another reason to make Coliseum Northside their choice for healthcare. Thanks to Kim Mancin and Ryan Moyer from the South Atlantic Division for bringing this group together. Pat, Michael and Angela met with the Director of the StaRN program on Wednesday, an innovative program that will be introduced to the Middle Georgia Market at the end of August. The purpose of this program – Specialty Training Apprenticeship for Registered Nurses (StaRN)—will help address our facilities (CNH, CMC and Fairview park) nursing shortages by onboarding and developing recent nursing graduates or those nurses who have not worked in an acute care setting before. It is an intensive, 13-week program that combines classroom instruction, a robust simulation experience and hands-on clinical training. One of the most exciting parts of this program is that CNH will be the site of the simulation lab for this cohort, which will consist of approximately 25 students. As many of you may know, we have been working hard to offer urology services here at CNH. With that being said, Dr. Brian Geary has requested to have block OR time, starting in mid-July (yeah)! We will be making some minor changes on the 2nd floor to provide more privacy for those patients who will be having urology procedures in the recently created procedure room. “Cathy Walden has such an outgoing attitude and is a delight to talk to on the phone. She goes out of her way to make sure you get what you order, and if need be, she will hand deliver it herself. It’s so refreshing to be treated so special. Thank you for everything Cathy”. “Jill Meade is a wonderful nurse that constantly strives for the best care for her patients, with me being one of them. I really appreciate everything she’s done to take care of me. Thank you for being who you are, which is an outstanding person and nurse”. Thanks for a great patient care week and have a safe weekend! « Meet FRIST & Updates with Lance!